Maybe you’ve already seen it on Facebook or YoBeat. Perhaps you were one of the lucky 390 people that drove to Stevens and purchased a $12 ticket to ride Hogsback lift on Saturday. If so, you felt the stoke. 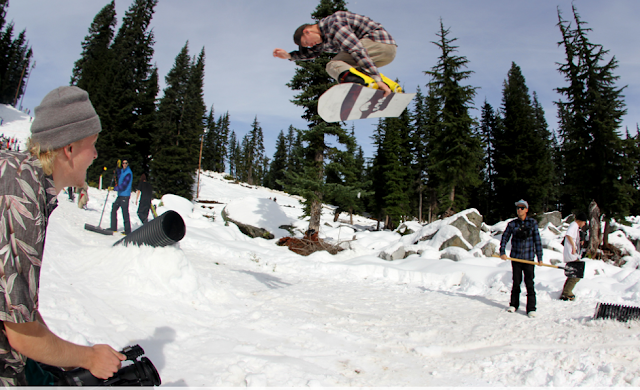 After a little investigative reporting last Monday, when a few of us hiked the hill for some “exploratory turns” at Stevens, the VP of Operations at Stevens Pass, Joel Martinez, eyes grew wide. "What if we could open up and let ANY number of people shred this early snow? What if we DIDN'T limit it to just 50 elitists or so? Could it be done efficiently? We really shouldn’t let this snow go to waste. That would be really INEFFICIENT." This is how JOEL’s mind works. Even though this is a business, even though there was a goverment shut down, even though we are supposed to think about things like “the bottom line” and making a profit, really he’s in this business because he loves to enable people to get WICKED. He knows what skiers and snowboarders want because he’s one of them. JOEL turned his “what if” questions into reality Saturday, by opening Hogsback lift to anyone that wanted to go up and shred a makeshift jib course. The marketing department was placing bets on how many people would turn out. Nate said 140, Chris said 120 and Jules said 160. I guessed over 200, but JOEL said 300+ people. It really happened. Stevens Pass was the first mountain in North America to open up to the public for shredding for the 2013/14 season. It's refreshing to know that there are still pockets of the ski AND snowboard industry that aren’t corporatized. 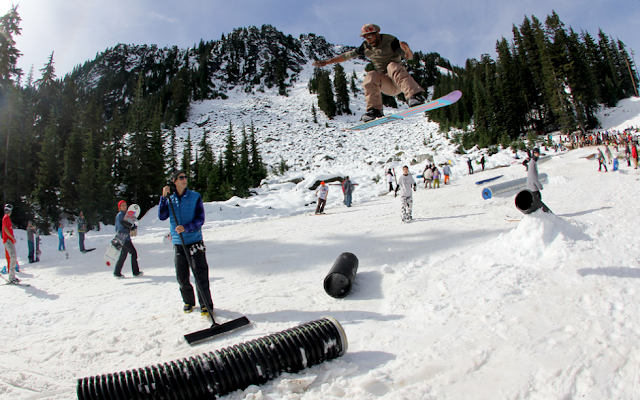 Some shred areas are still run by people with a passion for the LIFESTYLE. And we're so fortunate that JOEL is one of those people. Support people that run EFFICIENT recreation areas. Good times. Nice work. Looks like it took a village to make it happen and that good times were had by all. Nice work Stevens Pass and crew.